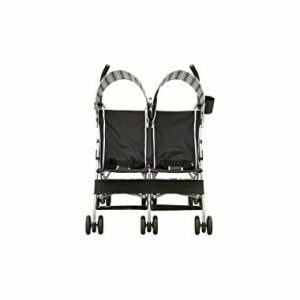 The whole unit features a strong and sturdy construction to ensure maximum swing stability and exceptional durability. The frame features metallic constructions while other parts are built with plastic. 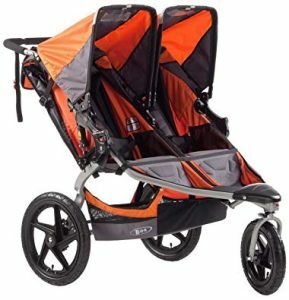 Thus, it will comfortably secure kids up to a maximum weight of 30 pounds without breaking. In fact, as your baby grows, they will tend to love this swing the more. This construction makes the unit very durable allowing you many years use. When you choose this baby swing, you will get 2 products in 1. It’s both a swing and rocker offering a lovely experience to your baby. 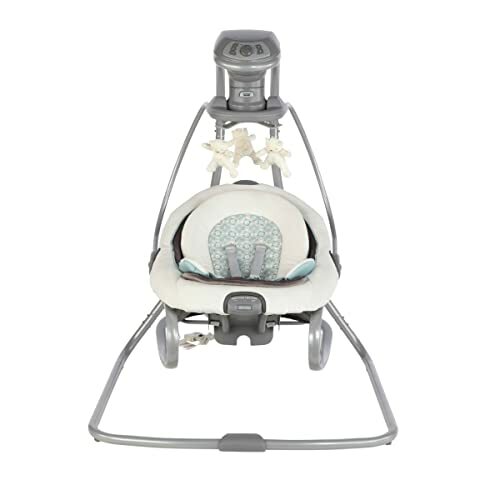 The rocker function allows you to move your baby around the house allowing you to spend some precious time with him. You can even remove the infant swing seat to create a constant seat for your lovely kid. 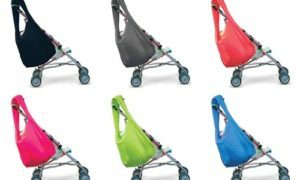 The swing and rocker doesn’t come at an elevated price, so it’s a great product for parents who want more benefits at an inexpensive price. Most baby swings come with only 2 seating positions. 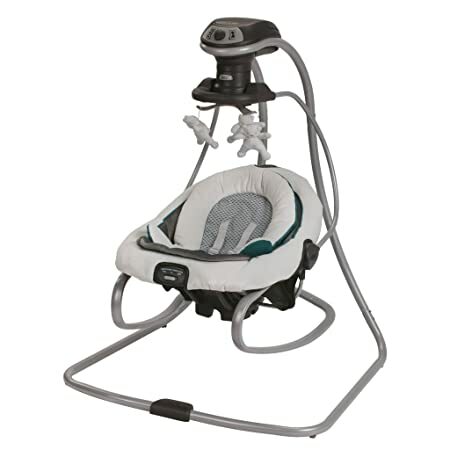 However, the graco duetsoothe comes with 3 seating positions to offer your child unparalleled comfort. You can choose from swing front to back or sway side to side. It gives you the option to choose the seating position that works perfectly for your little angle. 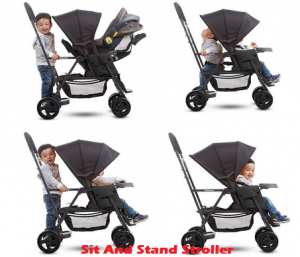 These 3 seating positions also give you the option to secure your baby in a resting or sleeping position. 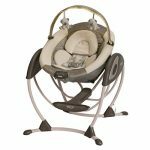 Although some baby swings come with only 2-speed settings, this rocker plus swing comes with up to six-speed settings. These 6 swing speed settings are ideal to give your child enough comfort at different moods. A very young baby will appreciate the speed number one while the other speeds are for the growing baby. You will also have an easy time because you will switch different speeds when soothing your baby. 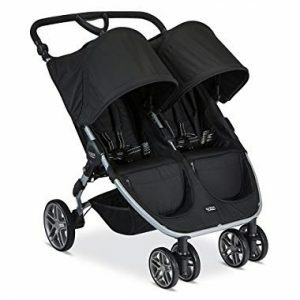 Just select speed one or two and you are ready to give your baby a great experience. It offers excellent safety and entertainment to your child. 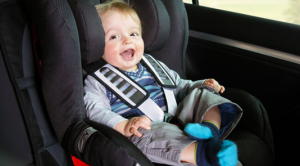 For safety, it has 5 point harness that maintains secure positions for your child. The seat pads feature thick padding to ensure your kid’s legs and head are in a comfortable position. For entertainment, it comes with 10 melodies and 5 nature to amuse and delight your baby throughout the day. Also, it includes 3 soft toys that “fly” overhead to keep your happy and engaged. This baby swing is very adaptable unlike, the swings that are built for only girls or boys! It has neutral colors that meant for both boys and girls. This wing weighs about 24 pounds; thus it’s ideal for frequent movements. 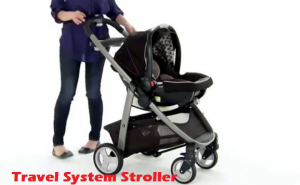 It secures kids from a tender weight of only 5.5 pounds up to a maximum weight of 30 pounds. Moreover, it’s roomy despite the thick padding. 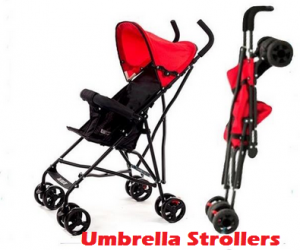 Its adaptability nature ensures you give your baby an exceptional swing and rocking experience. It produces loud noise when swinging. It’s slightly heavy at 24.2 pounds. 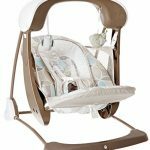 This graco duetsoothe swing + rocker – winslet reviews address all the features that you have to know before making a final decision. This swing seat is worth the value of your cash. 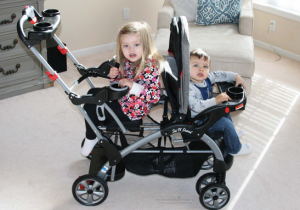 It includes numerous features that kids and moms love. This swing comes with 10 melodies and 3 flying toys to give your child a great resting experience. It’s roomy despite the thick padding. Moms who want great experience for their kids should consider this baby swing.